Home-use assistive devices will first require a great deal of training and effort for the user. As a result, we thought the integration of the Amazon Echo would greatly assist this process, and facilitate ease of use as Echo also continues to improve. Tell us a little bit about Bionik. Bionik Laboratories is a pioneering robotics company focused on providing rehabilitation and assistive solutions to individuals suffering from neurological and mobility challenges through the continuum of care from hospital to home. Bionik has an extensive portfolio of products focused on upper and lower extremity rehabilitation and mobility for stroke and physically impaired individuals. What type of robotics are at the core of Bionik Laboratories’ business? Our commercial/clinical product line, InMotion Systems, provides rehabilitative solutions for stroke survivors and people recovering from serious neurological impairments who must re-learn upper or lower extremity movements in order to restore mobility. Our InMotion Systems are currently used in more than 200 hospitals and clinics across 20 countries worldwide. We also have a product in development, our ARKE™ Exoskeleton, which is a comprehensive lower body exoskeleton that allows patients with paraplegia, or other people reliant upon wheelchairs, the ability to rehabilitate through walking. We are also working with our partner Wistron Corporation on a lower body wearable assistive product, based on some of the ARKE™ technology, which should allow certain individuals to walk better when they have limits, and this product will be launched into the consumer home market. Give us some examples of how Bionik’s robotics technologies are already improving results for patients with neurological injuries or mobility issues versus traditional therapy methods in clinical settings? Recent research on motor learning interference, motor memory consolidation, and robotic therapy shows that the best way to optimize outcomes for patients with neurological impairments is by utilizing robots and human therapists in tandem, where the robots focus on reducing the physical impairment while the therapists assist with translating the gains in impairment into function. Bionik InMotion System can guide the therapy treatment in a way that is much more precise and adaptive than a human can provide, since it can process a large quantity of data in real time, resulting in a robot that gets “smarter” as it learns the patient’s capabilities. If a patient can’t move on their own, the robot will guide the patient through the physical movement, re-training muscle memory and finding new neuropathways in the brain. As the patient regains strength and ability, the robots know to provide less assistance so there is greater challenge for the patient, while still precisely guiding them. Our technology also allows the robot to provide quantifiable feedback that a human therapist can’t. It can be difficult for a patient following stroke to understand the progress they have made if they cannot see gross movements of their fingers or other limbs, which can cause frustration. However, our InMotion System can track even the slightest movement due to our data capture of the built-in sensors, allowing the therapist to show incremental improvements and track patient progress. 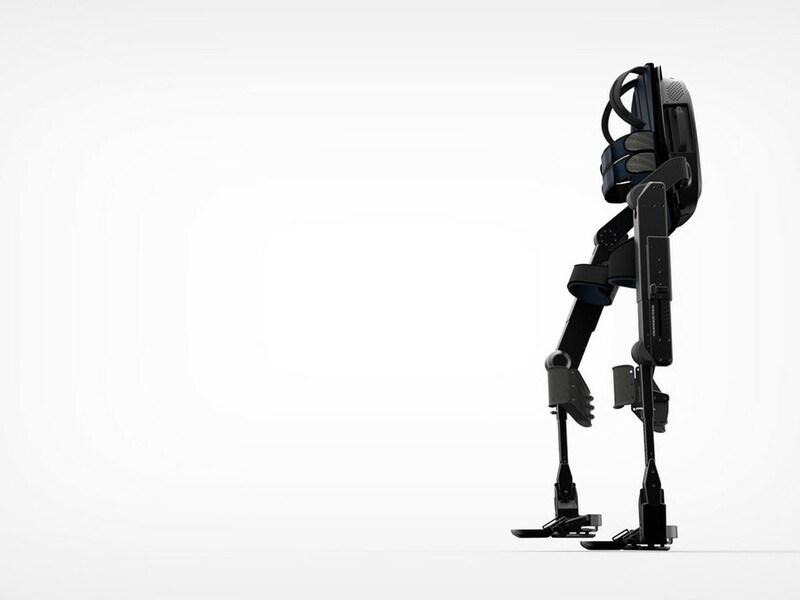 Tell us about the ARKE™ exoskeleton? Our ARKE™ exoskeleton is a complete comprehensive lower-body exoskeleton that allows patients with paraplegia and patients in a wheelchair the ability to walk. 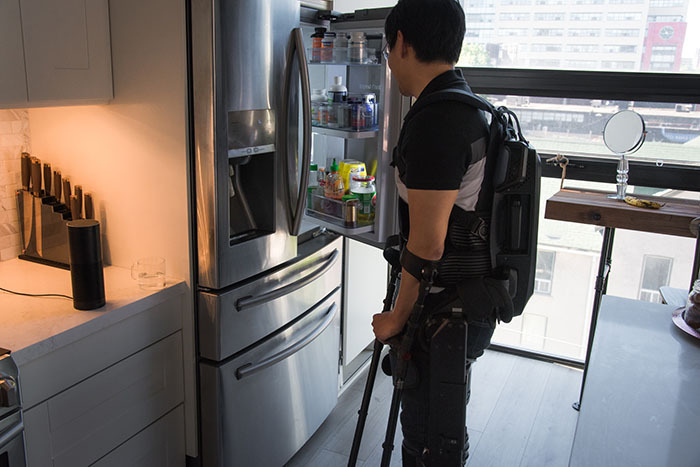 Though the exoskeleton is currently in clinical development, it will initially be used in a clinical environment, with the ultimate goal of being available for home use. The exoskeleton is currently in its second generation, which is a modern industrially designed exoskeleton with novel walking gait trajectories, and has significantly smaller mechanics and actuator components than our previous versions. This version includes the integration of Amazon's Alexa voice assistant into the exoskeleton, greatly facilitating the use for patients when attempting any certain type of movements. The primary focus of the ARKE™ exoskeleton program is to achieve a technology level that will allow such a device to be used outside of clinical environments as a lower body wearable assistive product for a wide range of patients, at an affordable cost. What makes the ARKE™ exoskeleton so innovative? The trend in healthcare right now is to move patients from expensive healthcare systems to their home. However, many patients have severe disabilities and will need robust assistive technologies to be mobile in their homes and allow independence. Home-use assistive devices will first require a great deal of training and effort for the user. As a result, we thought the integration of the Amazon Echo would greatly assist this process, and facilitate ease of use as Echo also continues to improve. We’ve entered about 50 different commands into the ARKE™, including stand, sit, and walk. We’ve included the ability to enter a manual mode and change different variables, including stride length, so a person with paralysis can use their voice to set a stride length, such as 12 or 24 inches. We’ll continue to add additional capabilities over time as the product evolves and we find additional needs through clinical testing. The commands would be similar to how you use Alexa to turn on lights or listen to music. An action item is needed – “Alexa, stand me up” or “Alexa, stop walking – in the same way you’d say “Alexa, turn on the lights.” "Alexa, I'm ready to stand" vs "Alexa, I want to stand up." The exoskeleton adapts to your voice. What are the target markets for your ARKE™ exoskeleton and lower-body assistive exoskeleton robotic technologies? Our primary market for the ARKE™ exoskeleton will be the clinical market. Our lower body wearable assistive product, based on some of the ARKE™ technology, allowing certain individuals to walk better, when they have limits, will be launched into the consumer home market. According to the last census, approximately 30M people in the U.S. alone have a disability that makes it difficult for them to walk or climb stairs, forcing them to use a wheelchair, cane, crutches, or a walker. The Center for Disease Control and Prevention reports that 18.2M adults in the U.S. can’t walk a quarter of a mile. As such, there is a much bigger market opportunity, both in the U.S. and abroad, for Bionik’s assistive exoskeleton robotics for those with physical disabilities and mobility impairments. Another significant market lies within the aging population, both in the U.S. and abroad. The CDC reports that almost 60% of adults over the age of 65 have difficulty completing at least one physical action, while the census states that citizens older than 80 are 8x more likely to have a physical disability. Today, according to the National Institutes of Health, 8.5% (617M) of the global population are aged 65 and over, with that number projected to jump to 17% (1.6B) by 2050. These are individuals that will have mobility issues as they continue to age, and will be reliant upon devices to get around and maintain their daily life. Geographically, we are initially targeting the Asian market for the consumer release of the ARKE™ and Bionik’s assistive exoskeleton robotics because they are a population that is already much more advanced with robotics. It’s mainstream – robotics are everywhere and there is much more familiarity and comfort interacting with them. The Asian population is also one of the largest on the planet, and its aging population is expected to quadruple by 2050, according to the NIH, growing to nearly 923M people. What are the barriers currently for the assistive robotics market? The healthcare field is one that is highly regulated, so there is a great deal of research, development, and testing done on medical technologies such as assistive robotics before they are given approval for sale to consumers. Safety is obviously a concern – we’re talking about people’s health, wellbeing, and quality of life. We’re really working hard to ensure we have the best and safest product we can. One of the other barriers into the market can be cost. On the clinical side, it’s much easier for a hospital or medical facility to pay thousands of dollars for a machine that they can pay for through a recurring revenue stream from patient treatments. On the consumer side though, it’s not realistic to think that the majority of consumers will be able to afford an assistive robot costing many thousands of dollars without some sort of insurance subsidization. So, we’re working with a partner, Wistron Corporation, to develop our lower-body assistive exoskeleton robotic technologies at a price point that is much more obtainable for the average consumer. Take a look into the future 5 to 10 years, how are we using assistive robotics and how has it changed the way we live and work? My vision is that we’ll continue to see a steady evolution of robotics in general both in the medical industry and beyond. As a society, we’ve long relied upon technology to improve efficiency, productivity and quality of processes. With innovations like robotics, virtual reality, artificial intelligence, and brain-computer interfaces, this industry will only continue to grow. Within the medical space, I think we could begin to see a sharp decline in things like canes and wheelchairs as more advanced technologies enter the market. Industries like manufacturing, where a robot can be programmed to repeat a task over and over, will likely see a rise in robotics as a way to increase wellbeing, efficiency and production time. Last, I think we’ll see a significant uptick in robotics within the consumer space, as we seek out ways to further improve our daily lives. Dr. Eric Dusseux is the CEO of Bionik Laboratories, Inc., a robotics company focused on providing rehabilitation and assistive technology solutions to individuals with neurological and mobility challenges from hospital to home.